Genealogy can be tricky. On one hand we have oral stories passed from generation to generation, each woven through the viewpoint of the person telling it. On the other, we have historical data such as census records, newspaper articles and Bibles, all factually recorded in days gone by. The stories bring life to the data. The data brings credibility to the stories. And once in a while, the fine thread separating the two becomes extremely ragged. But I’m sure that never happens in our family, right? This week, we’re going to look at the Gulick side of the family. Gulick was Gladys’ maiden name (Gladys being Duane, Bruce and Jerry’s mother) and her family farmed in rural Williamston, MI, during the 1900s. Jerry has gathered extensive information on the Gulicks from the State of Michigan Library, including the book Gulicks of the USA, by David E. Gulick. Interestingly, what he found corresponds with information that Joel (Duane’s son) found online, entitled Gulick Family Papers, Princeton University, NJ. I’ll summarize, but it’s probably worthwhile to read the book or online version. In a previous blog post, Jerry told us the name Gulick originated in the Dutchy of Julich, which is located in northwestern Germany, near the border of the Netherlands (Holland). As Germans, prior to 1350, our ancestors spelled their name Gulich or Guliche. When they moved westward into the Netherlands, they adopted the Dutch spelling of Gulick. In 1653, Hendrick and Geertruyt Gulick immigrated from Amsterdam, Holland, to New Amsterdam, which is now New York City. They came with their two sons Jan (John) and Jochem. It’s interesting to note that in 1687 Jochem took the oath of allegiance to Great Britain (remember, America was still under Britain’s rule) and was a captain in King’s County militia. He also purchased 85 acres on Smokey Point, Staten Island. Can you imagine the value of that land today? Jochem’s the guy we’re interested in. Jochem begat Pieter; who begat another Jochem; who begat Willem; who begat Peter; who begat George Washington Gulick, who as a child moved with his parents to Michigan. We’ve now just covered 200 years (and it feels like we’re reading Genesis 5 from the Bible). Are you keeping track of all this? Maybe you’re currently expecting and looking for baby names? You know, it’s always good to go with a good, strong family name. Here are the women that go along with these men— Jacomyntie, Eva, Cornelia, Eleanor, Mary and Amanda. Each of them had maiden names beginning with Van, meaning we truly are a dutchy family (except for Amanda, who traces back to Hungary). Let’s jump ahead to 1853, when George Washington Gulick and his bride Amanda (Capen) built a log cabin on Epley Road, near Williamston. This area, about 15 miles southeast of Lansing, is where the Michigan Gulicks flourished. In fact, there’s even a Gulick Rd. And it is here that George, according to family lore, could cut logs and build a cabin in one week. George and Amanda had this great family of 11 children, seven of whom were living as of the 1900 U.S. Census. So here we have a start to the Gulick genealogy. There’s more to come—another 100 years—so stay tuned. Discussing the Gulicks with Duane, Bruce and Jerry is an interesting reflection on their childhood. Duane and Bruce don’t know much about this side of the family because, as they mentioned, they didn’t spend much time with them when they were growing up. Jerry, on the other hand, did. He maintained his relationship with Gulick relatives into his adult years and heard many stories. 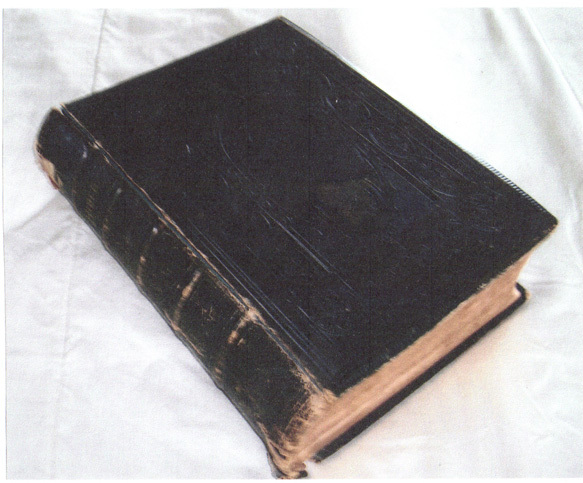 It’s Jerry who has a lot to pass along to us, including George and Amanda’s family Bible, shown above. He also provided George and Amanda’s obituary articles, shown below, which are glued to pages within the Bible. And lastly, Jerry sent the picture of a house, shown below, that may be the house George and Amanda built on Haslett Road. This entry was posted in Genealogy, Germany, Gulick, Netherlands, Williamston by adunate. Bookmark the permalink. We are not at all sure about the little house or cabin. The picture may have come from Joe Gulick (JR) and might have been where two of the Capen brothers lived. It looks like stone rather than log construction. The earliest settlers like George and Amanda (Capen) built log cabins. It would be interesting to see how this area has developed now and if any of the Gulick homes are still there. Maybe that should be a group activity when we have the reunion. Good idea Di……… More about the small house. It might be the home of John Capen and Fanny Holcomb (parents of Amanda) who came from Fane N.Y. in 1837 to Oakland Co. Michigan. After Geo. and Amanda married and moved to 80 acres near Williamston and settled with a log cabin on Eply Road, the Capens must have followed and built the house on Zimmer Road just around the corner. Here is a little different account : George and Amanda were married on New Years day 1852 at her parents home in Oakland County. Then George, his father-in-law John D. Capen, and Amanda’s brother-in-law Henry Wilgus started with their families from Oakland with three ox teams passing through much wilderness to their previously purchased land near Haslett Rd. George quickly built a temporary log cabin thirty rods east of the Capens cabin on the South side of Eply Rd. That is a great idea, Di! Maybe we could check out Laingsburg too, to see if thre are any Laing homes left. Of course the Amos boys may already have the answer to that. At a Gulick renunion (almost 30 years ago) I learned that my husband’s relatives had worked for the Gulick’s on their farm in Williamston. I also learned about Amanda (Capen) Gulick, and, being pregnant for my second daughter at the time, we decided to name her Amanda. So my kids have a second connection to the Gulics, sort of, through their father. Small world! Uncle Jerry, do you know if there is any mention of the Wickhams working for the Gulicks? Sorry, we do not have any mention of Wickhams in the Gulick papers. I’m not sure who we talked to at the reunion, but she remembered the Wickham name and knew Gary’s relatives. Shelley, that’s really neat that you took Amanda’s name from the family. And yes, you do have lots of date correlations! Wow, there are some real coincidences in Amanda’s life and mine! She and George were married on January 1; my daughter, Amanda, was born on January 1. She died on May 31; I was married on May 31. Her son, Perry, died on February 4, my birthday. How wierd is that!?! Maybe, but I don’t think I look much like her! Had a great lunch with my two uncles and their wives today! It was so good to see everyone again and to hear more family stories. Thank you Uncle Duane and Uncle Jerry! That’s cool. Sounds like you had a good time! Joe Gulick (Jr) from Williamston took me to a relative of ours, Eva Eberly Ryan who had some interesting information. Her grandmother was Eva Grace Gulick. Eva Ryan said that Amanda Capen remembered, as a small child, that a bear was pawing at the cabin door when her father John was away. She told her mother that she could touch the bear through a crack in the door..
Re the bear story…..of course this did not occur at the cabin near Haslett Rd. but when she was a small girl in Fane, NY or Oakland Co, Mich.
Where was this site when I was researching the Gulicks in my line? :-) Amanda Capen’s grandfather Samuel Capen is my 4th great grandfather. I’ve spent numerous hours in the State Library and tramping around the cemeteries near Williamston.